Here is an account of the Society of Ancients Conference held in Kenilworth, Warwickshire on the 14-15 October, by Roy Boss, Society President. The second 21st century SoA conference was an excellent event which combined scholarship and learning and some good gaming! Matt Bennett took us through the development of the mediaeval cog...a round tub of a ship used in the Baltic and demonstrated some Russian card models (actually its a sort of foam board sandwich which has the ship sections printed on it). He then ran a game in which four cogs bristling with attackers assaulted the sea wall of a castle with a race to get over the walls and into to the interior of the fortification first. The defenders cleared the wall walk with missiles and placed ladders from the ships, meanwhile under fire from the crossbows, catapaults and boiling oil throwers. Eventually they all got onto the parapet and fought their way inside. What it showed was that the defenders have a tough time once one attacker gets onto the walk on even terms as they then cannot concentrate against the next ladders going up. Mark Fry gave an extensively illustrated presentation on Khmer armies from temples that he had visited and photographed in SE Asia. He went into great detail on the various weapons, costumes of different nationalities and elephant gear, also why it is likely that there are few cavalry and less chariots. It would appear that a major part of the armies was individual elephants, crewed by the nobility with supporting teams of infantry, that sought out opposing nobles on elephants for single combat. Very impressive with stacks of pictures. Hopefully to appear in a future Slingshot. I gave a lecture on Procopian Warfare which covered the Romans and their main enemies and dealt with such questions as why the Vandals chose to fight with swords only at Tricameron, why the Goths run away and come back so many times, how the Franks used the combination of angon and axe to effect, How the Moors aimed to overwhelm with masses of javelins and had some 'heavy' infantry too and how the Roman horse archers actually operated...oh and how Sassanian tactics worked and their basic similarities to Goth and Roman tactics. Lastly, how far can one really project the tactics of the Strategikon back to the earlier Procopian period. After the talk there were three Procopian games, based upon the battle of Dara against the Persians, Rome against the Goths and the Fields of Cato with the Romans under John Troglita against the Moors. Sam Marks opened with an illuminating talk on Polybius' view of Mercenaries and how his own background as a Greek and believer in the virtue of a city defended by its citizens and desire to accommodate Rome to that model may well have biased his account of Hannibal's army. Phil Steele ran an involving game using the Tony Bath collection of flats and very retro it looked too. Richard Lockwood, heroic organiser of the event , put on several games of Dux Bellorum one of which I had the pleasure to watch, where it seemed very necessary to kill off your opponent's skirmishers in order to restrict their ability to support their units and once done it was a one way street. 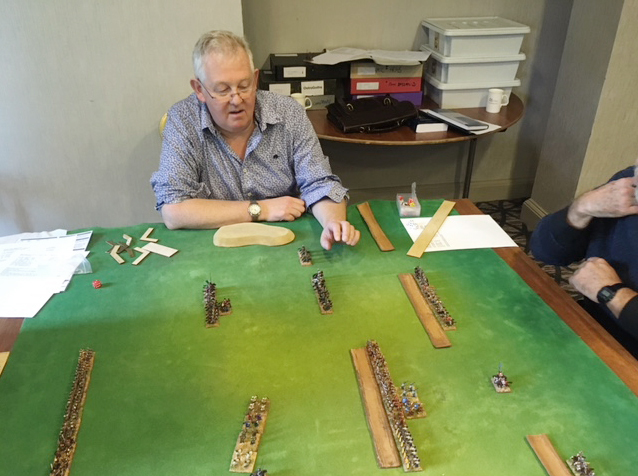 Richard had modified the Dux Bellorum rules to better reflect the need to fight in line so it looked more like a battle between armies rather than just retinues. Richard Lockwood explains the basic mechanisms of Dux Bellorum to the players. Simon MacDowall set up what appeared to be a huge table with a substantial chunk of Tunisia represented and using 6mm figures refought Ad Decimum with Vandals against Belisarius, which I understand the Vandals won. Simon had gone to considerable lengths to bring in the inability of the combatants to see each other and their own troops. The Vandals won, I understand, possibly because we underestimate their cowardliness! 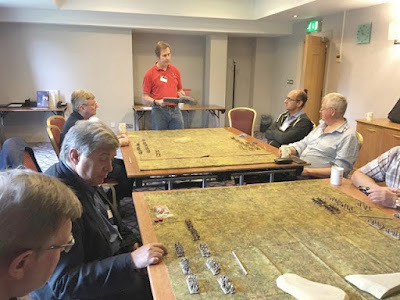 Lastly Will Whyler used large scale DBA to recreate Kadesh, both the camp and the city being on the table, with the Hittites having the advantage in surprise and numbers, but being constantly thwarted when Will, as umpire would dictate that this or that group must now loot the baggage before it could be redeployed after some tactical victory. We were joined by Phil and Sue Barker and enjoyed some expert help from Sue with the nuances of DBA in the Kadesh game.